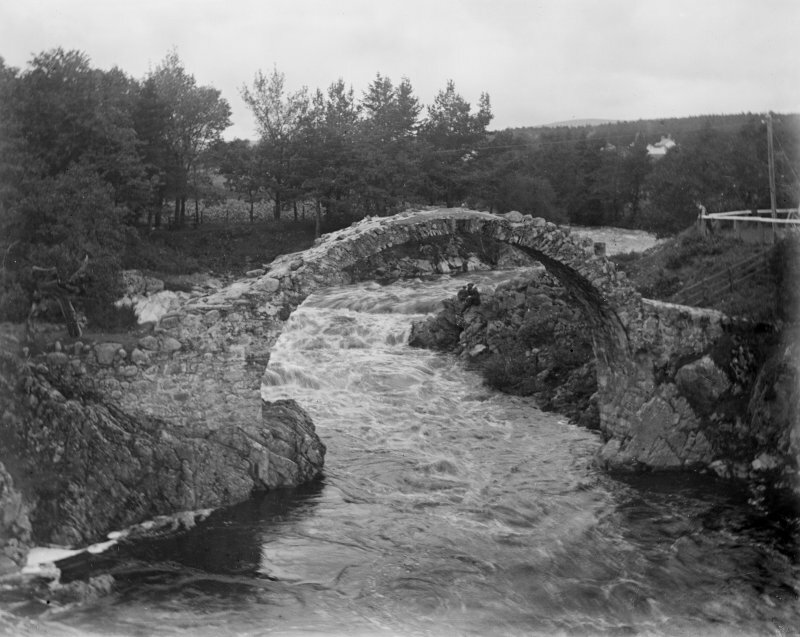 General view of Carrbridge Broken plate. 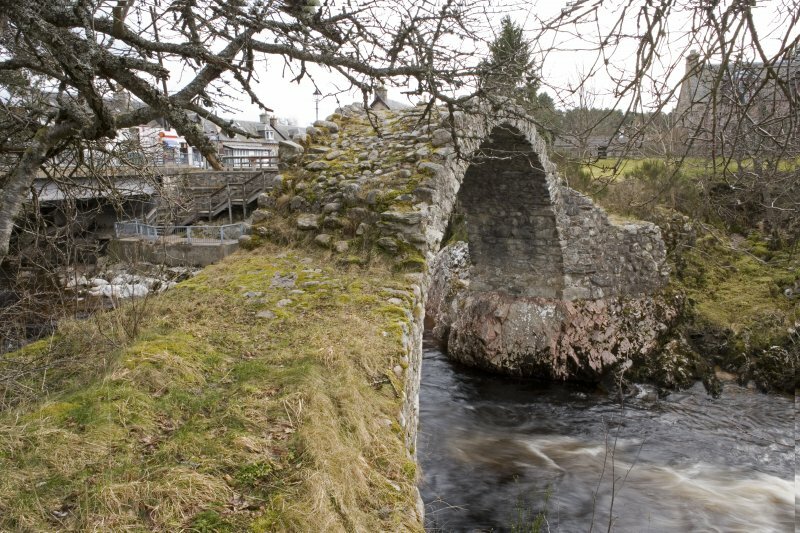 For successor bridge (adjacent to E), see NH92SW 21. 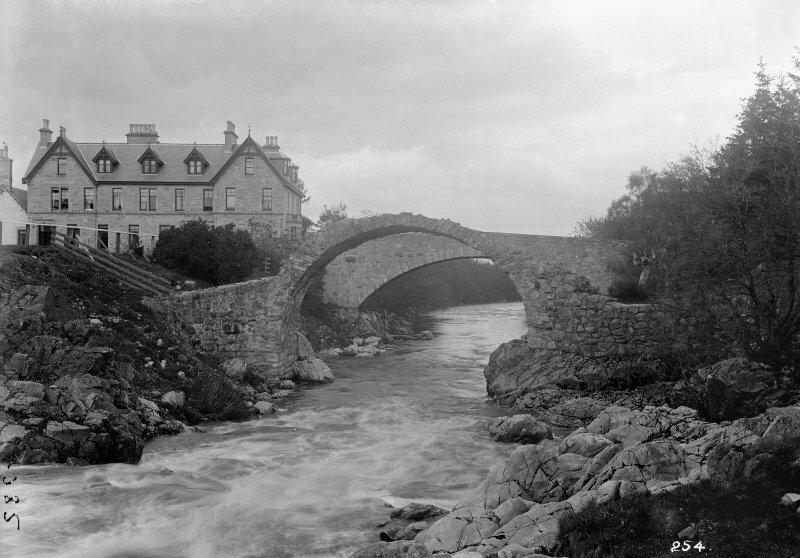 Built 1717. 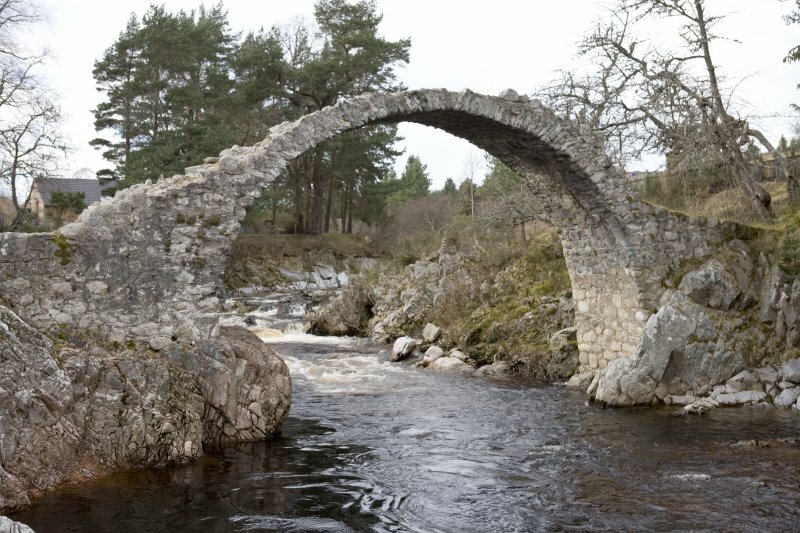 High single span humpback rubble bridge over River Dulnain; tooled rubble arch springing from natural rock abutment. 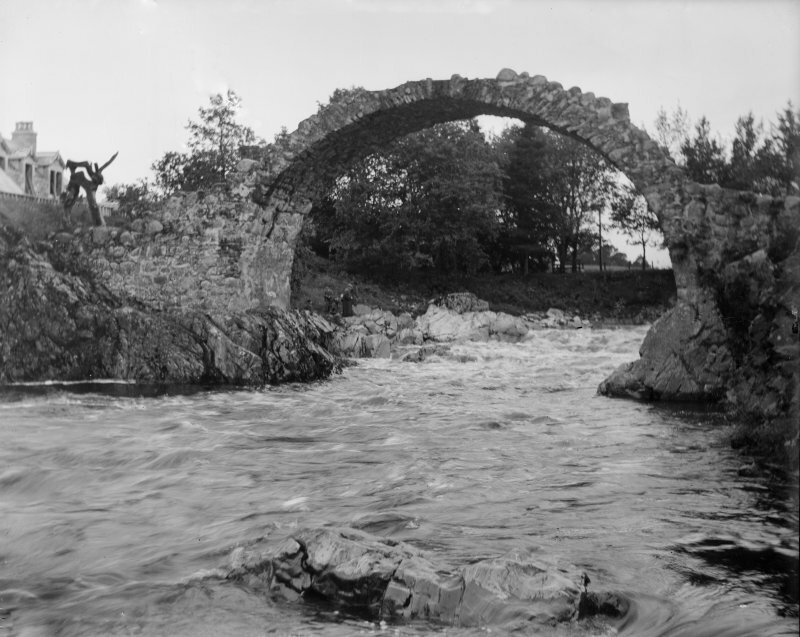 Neither surfacing nor parapet survive. 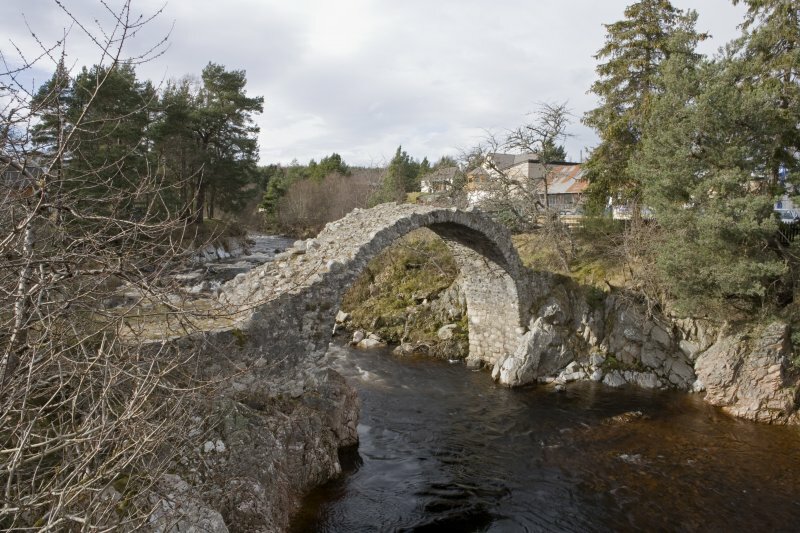 This bridge formerly carried a road over the River Dulnain at the N end of the village of Carrbridge (NH92SW 23) and to the W of the former line of the A9 public road (now the B9153). It is depicted, but not noted, on the 1982 edition of the OS 1:10,000 map. Built in 1717 by John Niccelsone, Mason. 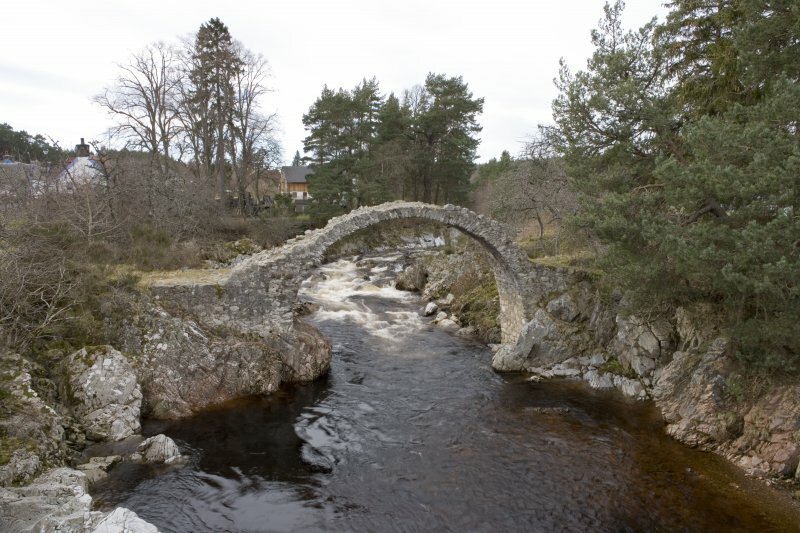 It had a width between parapets of 7 ft. 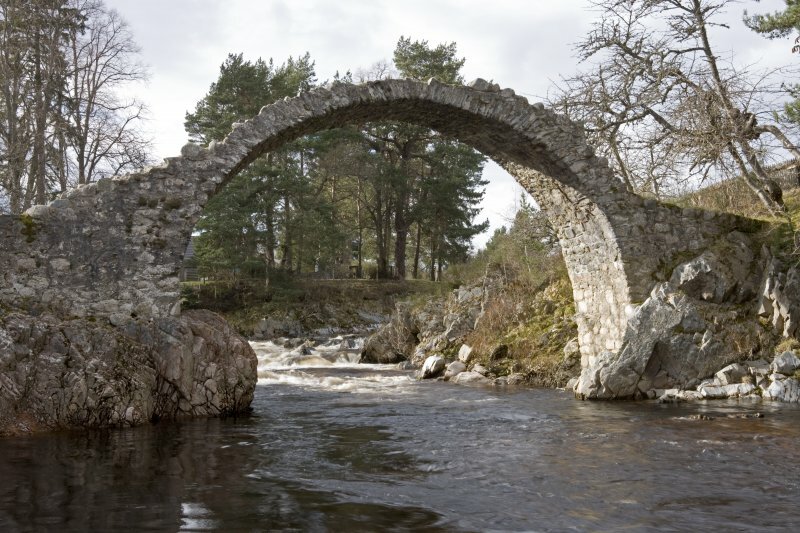 The remains, mainly the arch-ring, of a rubble stone almost semicircular arch bridge over the Dulnain, built in 1717. 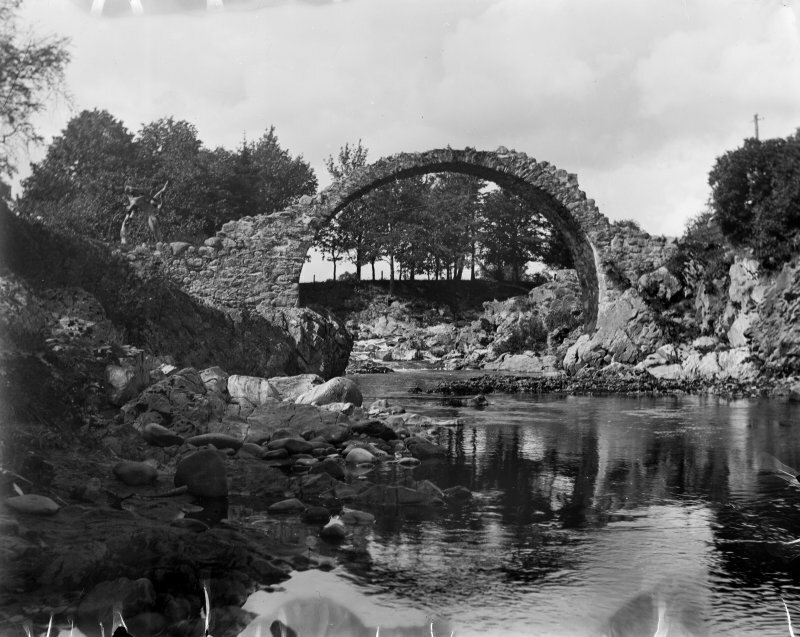 It had a width between parapets of 7 ft and the steepness of the roadway at each side of the arch indicates that the bridge was intended for pedestrian and horse usage. 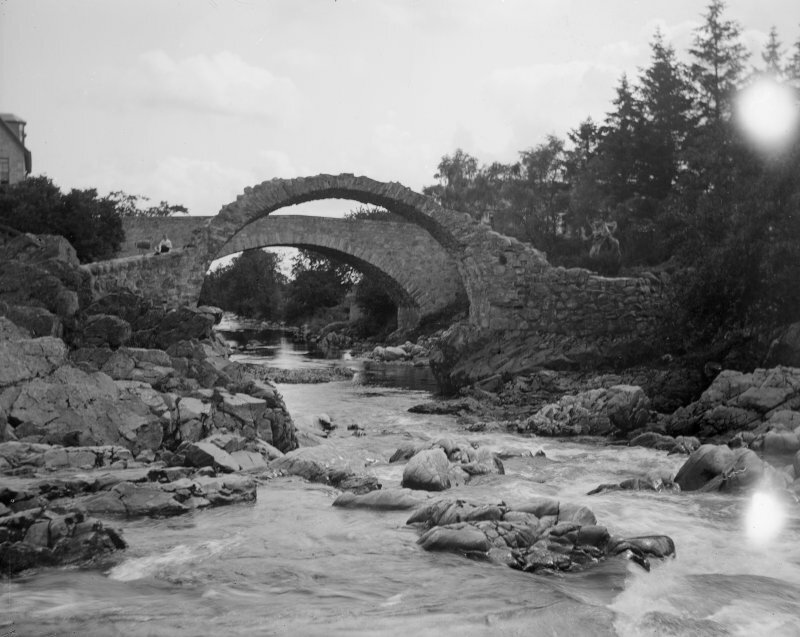 It is said to have been known as a funeral bridge because it facilitated the carrying of coffins to the burial ground and was reputed to have been built at the expense of the Parish by John Niccelsone, a mason, and cost £100. 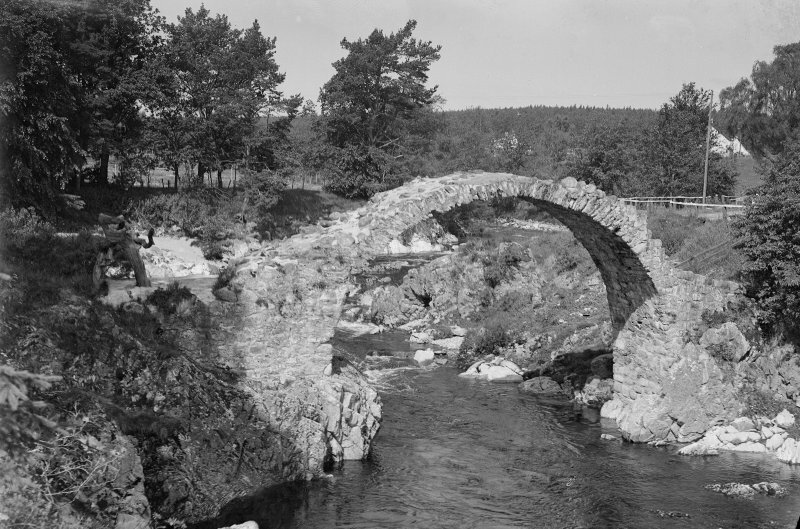 Sir Owen Williams’ slender reinforced concrete openframe arch bridge of the 1930s (NH92SW 21.0), was replaced by the present bridge. 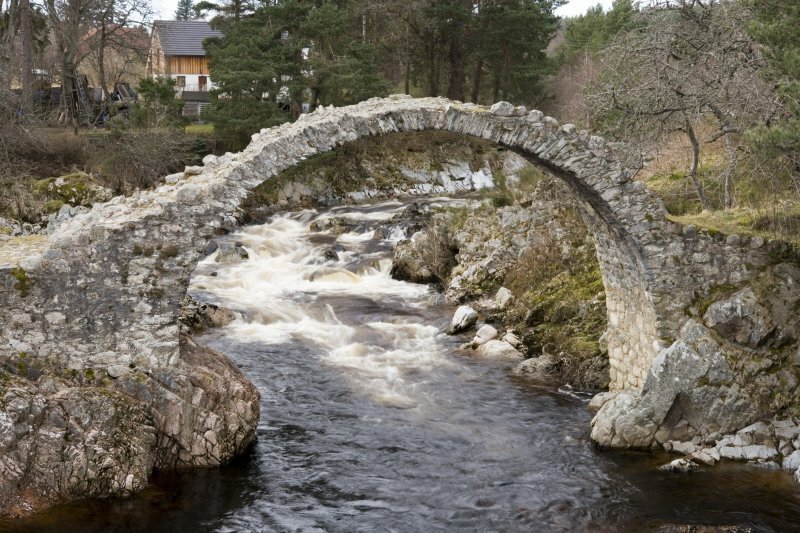 'At the beginning of the eighteenth century, to the inconvenience of both travellers and local people, there was no point at which the River Dulnain could be crossed when it was in spate, and burials at the Church of Duthil were often delayed. 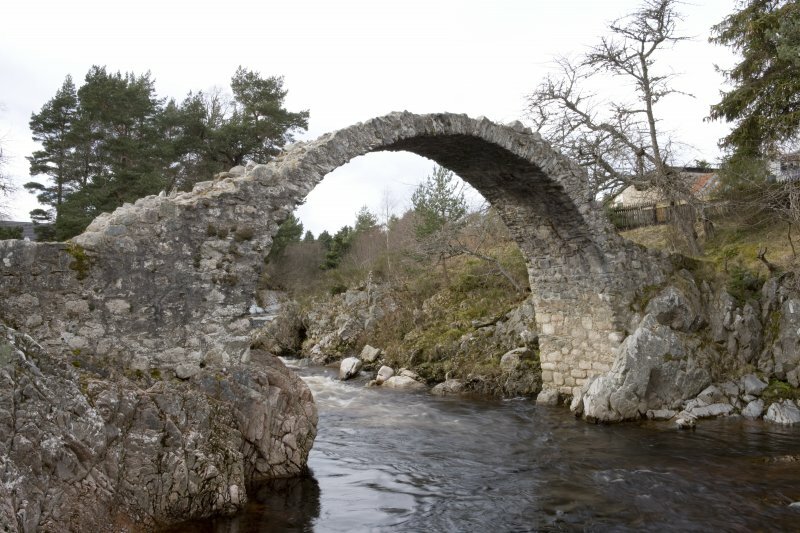 Brigadier-General Alexander Grant of Grant, Clan Chief, commissioned John Niccelsone, a mason from Ballindalloch to build a bridge at Lynne of Dalrachney. 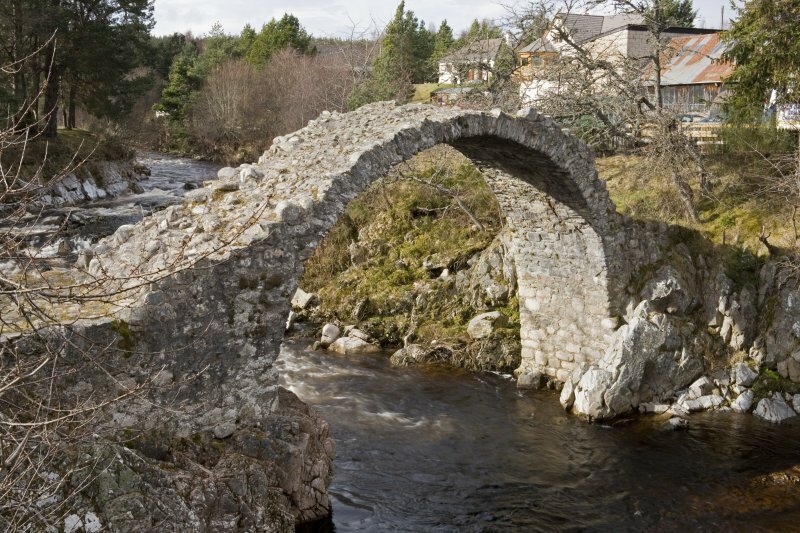 Built between May and November 1717, the bridge was paid for out of stipends of the Parish of Duthil.